Ask many to name details of the first powered flight and you'll likely get the standard answer, the Wright Brothers, Kitty Hawk, North Carolina on the 17th of December, 1903. Even a quick Google Web Search seems to confirm those details, so how could there be any question? The great thing about published history is it serves as a marker in time. Something published in a newspaper as contemporary news one day becomes valuable historic proof a century or more later. Case in point is an article found in an issue of the Bridgeport Sunday Herald, published on Sunday, August 18, 1901. 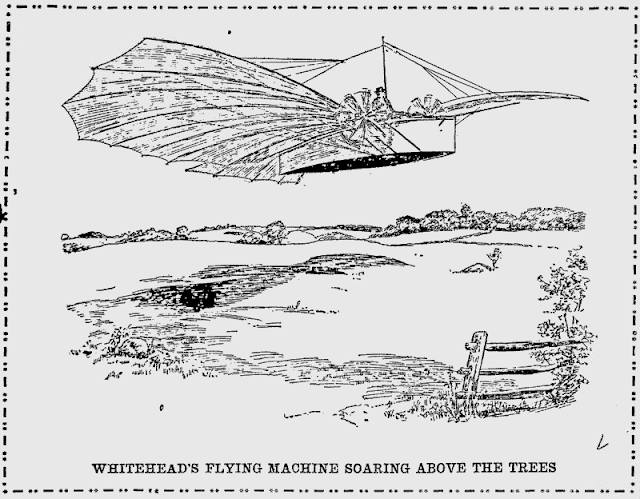 This was two years and four months before the Wright Brothers flight, yet includes intricate details to support the claim that inventor and aviator Gustave Whitehead had, in fact, flown a heavier than air, powered and navigable craft long before. This discovery was made by Connecticut genealogist Dan Lynch while he was researching newspapers in the Google Newspaper Archives. The collection includes more than 60 million digitized images of newspapers, many more than a century old and an invaluable tool for family and local historians. Rather than rewrite history, we'll transcribe the original article on a separate page so you can read it for yourself. It will be interesting to see how aviation historians and others at the Smithsonian now react to this recently uncovered evidence in the ongoing debate over the First in Flight claims.